I look for three things in a chocolate chip cookie: a caramelized sugar flavor, crispy edges and a soft center. I found my other cookie recipe to be a bit too thick and chewy so I changed a few things up for that perfect balance of crisp, buttery edge and chewy middle. With a hand or stand mixer, cream butter and sugars until light and fluffy, about 5 minutes. Add vanilla, eggs, salt and baking soda, mix 2 minutes more. Add flour and mix until just combined. Fold in chocolate chips. Form into tablespoon sized balls and chill in fridge 20 minutes. While dough is chilling, heat oven to 375 degrees and oil cookie sheets. Arrange dough balls on cookie sheets, about 2 inches apart. (They will spread a bit during baking.) Bake 8 minutes, remove from oven. Cool 8 minutes on their sheets and then transfer to a wire rack to finish cooling. Cameron and I spent this past warm and sunny Saturday at a cookout in our friends backyard here in Brooklyn. It was so nice to be outside in the sunlight. We brought hot dogs, grapefruit la croix, a green bean salad, chocolate chip cookies and these potatoes. This might be my new warm weather potluck recipe. I wanted something different than the usual picnic potato salad. More like a German potato salad. The roasted potatoes and red onion are tossed with thyme and a simple Dijon mustard vinaigrette. It’s a simple recipe that’s gluten free, dairy free and vegan. Remove from oven. Sprinkle thyme leaves over potatoes. Set aside until warm but not hot. Make the mustard vinaigrette by whisking mustard and vinegar together. While whisking constantly slowly stream in oil. Slowly adding the oil will help the vinaigrette come to together here. Whisk until all the oil was been worked in and vinaigrette is emulsified. Spoon over or toss with potatoes. A few weeks ago, I was wandering through Trader Joe's, arms full of an embarrasing quantity of plantain chips when I noticed these tins of young jackfruit. I had heard about this magical fruit that cooks and shreds like pulled pork but had not yet seen it in person. I grabbed a couple cans already trying to decide between bbq sandwiches or carnitas tacos. Obviously, tacos won. I would never put a sandwich before a taco. I love finding new ingredients. It happened a lot with AIP and when both Cameron and I were plant based. Even though I eat meat now, it’s still fun finding new meatless options to try. For someone who loves to cook, it's very exciting, like a mini adventure in my kitchen. When shopping for jackfruit, get the young or green kind - the other will be too sweet. Straight out of the tin, it mostly just tastes like the light brine it come in but will soak up whatever sauce or liquid you give it beautifully. You'll notice the jackfruit segments have two distinct parts: the flesh is soft and stringy the core is firm and solid. I just chop all of it up but I’d you’re looking for the real faux pulled pork experience that jackfruit is known for, you will want to remove and discard the firm core. We made tacos but this could also be used as burrito or enchilada filling. Combine all ingredients, except tortillas and toppings in the slow cooker. Cover and cook on high for 4 hours. Use two forks to shred if needed. Serve with tortillas and toppings of your choice like chopped lettuce, diced onions, cilantro leaves, lime wedges, pepita cream - anything you like. If you want to make a quick vegan crema just blend 1/2 cup pepitas with 1/4 cup water, 1/4 cup avocado oil and the juice of 1/2 a lime. Season with a pinch of cumin and salt, to taste. I love gummies. Any gelatin based gummy bear, worm, whatever is like catnip to me. I decided to make my own healthier, dye free version. These are refined sugar free, gluten free and Paleo friendly. Lots of healthy gelatin in these fruity little hearts. I love using frozen fruit for gummy candy - it’s sweet enough so there’s no need for any added sugars and gives a really punchy fruit flavor. Any mold can be used. I used two heart shaped ice cube trays from ikea. The recipe will make two full trays exactly. Feel free to try other frozen fruit like peaches or cherries. In a small sauce pan, heat mango, lemon juice and coconut water to a low simmer. Cook until mango is nice and soft, about 10 minutes. Don’t boil it or use a wide sauté pan or you’ll cook off all the liquid. Transfer cooked mango pieces and all the liquid in the pan to a spouted glass measuring cup, sprinkle with gelatin and immediately blend with an immersion blender until smooth. (Or do the same but in a regular blender.) Pour into silicone molds and place in refrigerator to set for 30 minutes. Remove from molds and eat/store or later. Cameron is brilliant with a grain salad. He makes one almost every week for a quick plant based lunch. I’ve been craving quinoa and this salad is crazy good - so different than anything I’d make or think of. It’s gluten free, too. It’s good served warm or cold. In a medium sauce pan, bring quinoa and 2 cups water to a boil. Cover, reduce to low and cook about 15 minutes or until quinoa is tender and water has been absorbed. Set aside. In a medium sized bowl, toss apples and shallot in lemon juice and pinch of salt. Let sit for 5 minutes. Add maple syrup. Add cooked quinoa, pecans, black beans and parsley. Drizzle with olive oil, sesame oil and toss. Season with salt and pepper. Such a pleasing, simple soup - healthy and vegetarian. I love the addition of lemon and dill to the classic combination of mushroom and barley. In a large pot over medium heat, sauté onions and garlic in dash of olive oil until soft. Add carrots, celery, potato, mushrooms, barley, bay, thyme and stock. Season with a bit of salt and pepper. Bring to a boil, reduce to a simmer. Simmer until barley is tender, about 30 minutes. Add chickpeas and dill. Season with salt, pepper and lemon juice. I’m pregnant! So happy to share that Cameron and I are expecting a baby girl this June. Currently, I’m 23 weeks along and starting to feel tiny baby kicks. I’m surprised how much I love being pregnant. It’s really great. I can’t wait to be a mom and start this new part of life with Cameron and our little one - so exciting! I’ll still be posting lots of recipes as usual but look out for a little bit of baby stuff here and there. These vegetable filled quesadillas happened because I have a summer squash left over from another recipe. I just couldn't figure out what to make. Of course, my mind when to dessert and I started interesting ideas for a molasses summer squash quickbread but then forgot about it. It's probably for the best because these quesadillas were great! The veggie mix it delicious on it's own. It would be great for a pot luck or picnic served as a salad. Or for lunch as a taco or burrito filling. Even over greens for a veg filled salad. This dish is vegetarian friendly but can be easily modified to be grain and gluten free depending on what kind go tortilla you use. Homemade plantain, cassava or corn are great options for those with special diets. If you have a non dairy cheese, you could make this vegan friendly too. I used a grill pan but feel free to use a griddle or sauce pan instead. Heat a grill pan over medium high heat. Lightly oil. Grill squash and broccoli slices, cooking about 30 seconds to 1 minute on each side. You want to see grill marks here. Transfer to bowl. Toss corn kernels in pan for about 3 minutes to cook down some of their starch. Add to bowl with squash and broccoli. Season with salt, pepper, chile powder and lime juice. Place a tortilla flat on lightly oiled grill pan over medium heat. Spread with 1/4 cup shredded cheese, then 1/4 of the veggies, top with 1/4 cup of cheese and a tortilla flat. Cook until cheese is melted, about 3 minutes. Carefully flip. Cook until tortilla is crisped and there are grill marks, about 2 minutes. Transfer to board and cut into wedges. Repeat with remaining ingredients for a total of 4 quesadillas. Here's another gluten free, grain free breakfast for you! 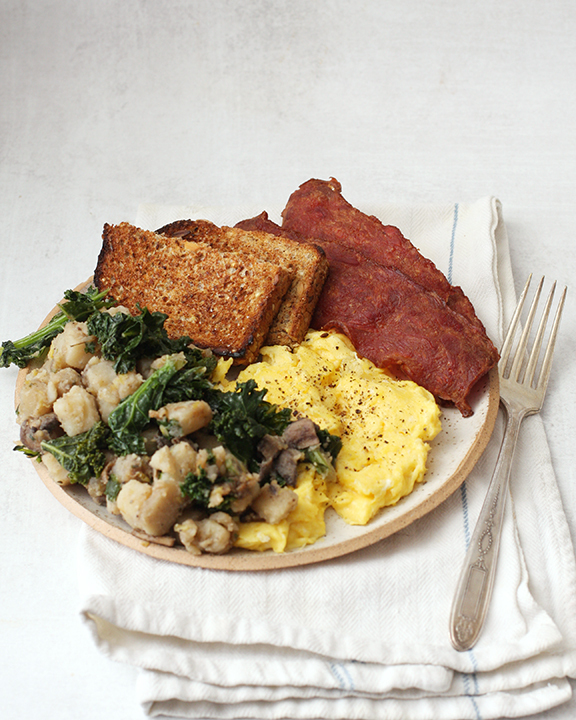 I made this vegetarian hash for brunch as an addition to scrambled eggs, toast and turkey bacon. And made a little scramble with eggs to take to work. It would also be good wrapped in a tortilla with hot sauce and melted cheese as a breakfast burrito to go. In a 12 inch skillet, set over medium heat, warm oil. Add potatoes, leeks, mushrooms. Season with salt, thyme, sage, pepper, garlic powder, onion powder and paprika. Cook until potatoes are tender, stirring frequently, about 15 minutes. Stir in kale and cook about 5 minutes more. I used coconut milk beverage (the boxed stuff) and it's good but a can of full fat or light coconut milk and a bit of water would be even better with more body and a stronger coconut flavor. I also used quick oats because it's what I had but the recipe can be made with old fashioned oats, they will just have to be cooked longer. See instructions on packaging for reference when cooking. Combine milk, pineapple, cinnamon, salt and vanilla in a 2 qt sauce pan. Bring to a boil. Stir in oats. Reduce heat to medium. Cook until oats are tender, about 2 minutes. Add maple syrup. Portion into bowls and add toppings. Cameron is vegetarian and I'm a full on carnivore so making dinner can sometimes be tricky. I was dead set on a chicken parm and figured cauliflower would be a good meat stand it. (I was right!) Depending on your preference, you can make a pan with the chicken and a pan with the cauliflower to keep things separate. To keep things healthier, I decided not to fry the chicken and cauliflower. Everything was breaded as usual but instead for frying on the stove in oil, a simple baking rack over a pan in a hot oven did the trick in getting things nice and crispy. If you don't have a baking rack, just place chicken and cauliflower on a baking sheet. This recipe can easily be modified to be fully vegetarian by omitting the chicken and using less (about 1 cup) bread crumbs. It will them only serve 2. It can also be made gluten free by using gluten free breadcrumbs. Heat oven to 475 degrees, use the convection or fan setting if you have it. Grease a baking rack. Arrange over a rimmed baking tray. Set aside. In a shallow bowl, combine bread crumbs, parmesan cheese, pepper, garlic powder, onion powder, basil and oregano. Set up your breading station assembly line style with your chicken and cauliflower on one end, then the beaten eggs in a shallow bowl, next the shallow bowl of now seasoned bread crumbs and finally the prepared rack. Start with the cauliflower. Dip a piece in the eggs, coating completely, dip into breadcrumbs - coating completely and place on rack. Repeat with all the cauliflower and then chicken. Bake 20 minutes, flip and bake about 10 minutes more. Check on things here and there to make sure nothing is burning. Things should be a crispy golden brown and the chicken should have an internal temperature of 160 degrees. Remove from oven. Carefully separate rack from tray. Arrange chicken and cauliflower on rimmed tray and top with marinara sauce and cheese. Return to oven and bake until sauce is hot and cheese is melted, about 8 minutes. I made this on Friday and Cameron and I happily snacked on it all weekend. It's an excellent snacking cake. I had a bag of super seedy clementine that I decide to turn into a cake. Serious cake cravings were happening over here. 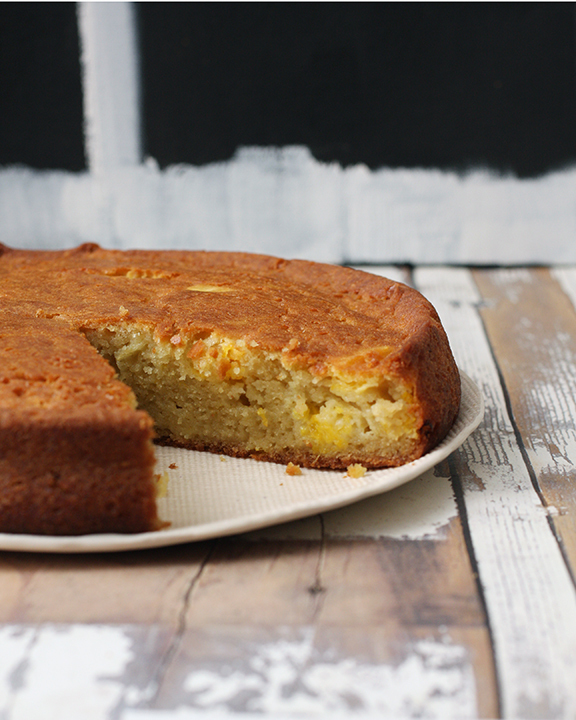 This cake is rich, moist, not too sweet and full of refreshing citrusy bites of clementine through out. It's one of those that are good anytime of day - a slice for breakfast, a slice as a snack or after dinner as dessert. When isn't a good time for cake? So good and similar to an olive oil cake. I used a combination of olive oil and coconut oil - its a flexible recipe. Just use what you like or have. Just keep in mind that different oils will lend different flavors to your cake. I'd recommend grape seed for mild flavor, olive oil for a moderate flavor or coconut for a heavy flavor. For the clementines, discard the peels and chop into small pieces. Pick out any seeds. That's it. We're adding pith and flesh to the batter. Heat oven to 350 degrees. Oil a 9" round cake pan. Set aside. In a medium bowl, whisk flour, sugar, salt, baking soda and baking powder. In another bowl, whisk oil, milk, eggs and clementines. Stir wet ingredients into dry. Do not over mix, just stir until it comes together and there are no steaks of dry flour or lumps. Pour batter into prepared pan. Bake 1 hour and 10 minutes or until set in the middle. A cake tester should come out clean. Remove from oven and let cool in pan before serving. I've gotten really into skincare. I blame winter and the fact that there are so many great brands seemingly available everywhere. Let's just say I have a nice long list going of items to try. Etsy is still one of my favorite places for online shopping. It has a nice sense of community and the sellers are friendly and there are so many items. And seriously, who doesn't love falling down an Etsy hole? I'm telling you, it is worse than pinterest. 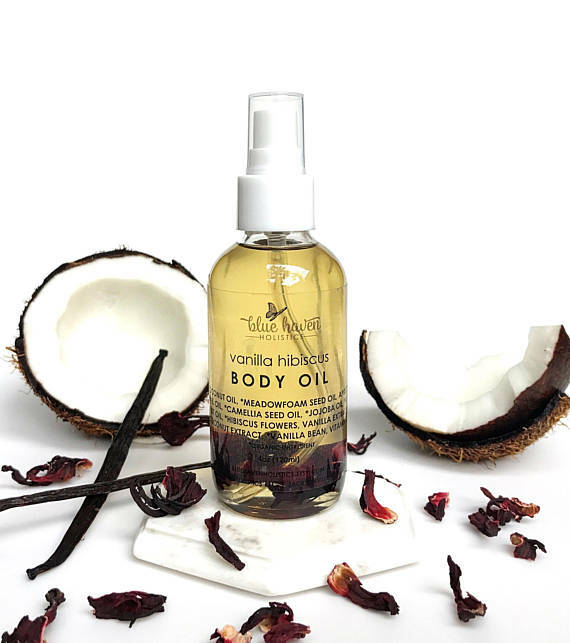 So here's a little round up of some fun skincare and beauty products on Etsy that check boxes for eco, organic, green, clean, vegan, small batch and natural. Enjoy! I'm really on a nut butter kick, especially peanut butter. I've been putting it on toast, dipping apple slices into it, smearing it on banana, making peanut butter and chocolate chip pancakes. I also made this smoothie. I'm always super hungry after the gym and this is my new treat. I love it so much, sometimes I go to the gym just because I know I'll make this post workout. Silly, I know but whatever gets me there! This shake is paleo friendly, gluten free, dairy free and refined sugar free. No sweetener at all, actually, just a very ripe banana. It's a peanut butter banana bomb with yummy notes of chocolate. It's also not very thick - more of a shake than a smoothie. Blend a bit more chocolate or use chocolate flavored protein powder instead of the collagen and chocolate. Not sure if I've shared this before, but I've found that instead of a traditional or high speed blender, we use a stick or immersion blender. Its so convenient to use - just stick it in whatever you want to blend and zip zip. It crushes ice no problem and is so much easier to clean. We have had and used this one everyday for about 4 years straight. It's a beast. The beginning of a new year always gets me thinking about my habits and routines: ones I have, ones to break, new ones to start, ones I want to research. Much of this always centers around health and wellness. For me this goes beyond just staying healthy with things like eating habits and exercise, its about taking care of myself and monitoring my general well being. Pondering this, I realized some of the funny little things I do everyday. After my Still's diagnosis in 2016, I've been interested in staying healthy like never before. Previously, being healthy was more about looking healthy than being healthy. I exercised and ate to be trim and toned. Nothing wrong with this but now my motivations are more about my overall health with an emphasis on preventative care. 1. Eat a spoonful of coconut oil or blend it into bulletproof style coffee. Right before I start drinking coffee, which is about 10 minutes after I wake up, I take a nice, beautiful spoonful of coconut oil. Mostly because my functional doctor told me to but also, it gives me energy and helps me avoid coffee crash. 2. Eat a teaspoon raw local honey because raw honey is good for you and its an anti inflammatory immune system booster that fights allergies and tastes good. I like to take it with the coconut oil so the fat balances out the sugar spike a bit. 3. Drink a scoop of collagen dissolved in water. I do this almost entirely for the cosmetic benefits. It's high in helpful amino acids and is beneficial to digestion, joints and skin. 4. Take a probiotic supplement or two because everything I read says that our overall health is related to the gut and guts love probiotics. 5. Limit coffee to no more than 6oz and all before 3pm. That's right - a strict limit on coffee. It's not the easiest one to stick as I love coffee but I like sleep more. Sleeping is much easier since I lowered my caffeine intake. 6. Drink a cup of ginger tea because I have to have something to perk me up at 3pm. Ginger is good for digestion too but I like it because it's so energizing. Sometimes I make a cup and add the honey and collagen mentioned above to get all that out of the way in one powerful little cup of tea. 7. Think happy thoughts. I'm not kidding. It's important to recognize the things that make me happy on a daily basis. It's not always big things but sometimes just the little things like a joke someone told me, a thing that I ate, how bright and sunny the weather finally is, Chibi's general cuteness. Life is good so why not? 8. Get enough sleep. This is non negotiable. I am very protective about my sleep time. I keep a strict routine. I wake up 8 hours after I go to bed. At least. I'm able to get enough sleep at this point in my life after years and years of insomnia so I make sure to guard and enjoy it! 9. Drink 64 ounces of water. I get to work, I fill up my quart container. I get home, I fill it up again. If I don't do this, I don't drink enough water and then I'm not hydrated. For me, dehydration makes me feel very foggy and tired. A well hydrated mind has all the lights on. 10. I take good care of my teeth. This is a new one. After taking pretty lazy care of my teeth for awhile, I had to have a deep cleaning. Deep cleaning is not a fun thing. It's also expensive so now I brush, floss, rinse and in between clean with the weirdest little pipe cleaner you've ever seen. 11. Dry brush. It's the best! Between this and the above dental care, it takes me forever to get ready in the morning but it's really smoothed my skin out and helped with circulation and lymphatic health. 1. More plants! This one is definitely happening. Bringing in many more plants for the apartment. So many you won't know if you're inside or outside. Plants produce oxygen, filter the air and are mood boosters. 2. Stretching. Adding a short flow of stretches to do first thing in the morning. I'll do this while I wait for the coffee water to boil instead of looking at the internet. 3. Develop a soothing, nighttime routine - specifically one that includes getting in bed at 10pm. (Don't judge! I get up at 6am for the gym or quiet time.) I think a self indulgent nighttime ritual sounds like just the cozy thing to incorporate this winter. I'm talking pjs, skin mask, pillow mist and books. 4. Be patient. Practice compassion and encourage positivity in my interactions with others, even when I'm not receiving those things from them. How about you? I'd love to hear about your daily self care practices. Snow day? No problem! If you're on the east coast, you probably experienced this 'bomb cyclone' that hit last week. Happily, I was told to stay home from work. Not only did I stay home but I made these paleo pancakes in my pjs and slippers because why not. Serious Sunday morning vibes happening. These are officially my snow day pancakes but you can make them anytime. Best thing is they are grain free, gluten free, dairy and sugar free. Yes! Also, no weird ingredients, just coconut four which you probably have already, right? What I like most about these is that the flavors are balanced with even tastes of banana and peanut butter and a nice does of chocolate here and there. No overwhelming coconut here. Add all ingredients except chocolate chips into a bowl and blend with a stick blender or hand mixer. You can also use a bender. Just zip everything until smooth, about a minute. Fold in chocolate chips. Heat a non stick skillet over medium low heat and lightly oil. Do not use too high of heat, lower is better - these guys need time to cook without burning before flipping than usual pancakes. Add heaping tablespoon sized spoonfuls to warm skillet. Swirl back of spoon over batter to flatten and spread a bit. They will be ready to flip when they are fully set in the center, about 3 minutes. Shake to pan slightly and look for wiggling in the center of the pancakes. If they look wiggly and wet, cook a little more before flipping. There will be plenty of bubbles in the batter, too. When, ready flip and finish cooking on other side. Second side will cook much faster, about 1 minute. Serve warm. I find these perfectly sweet so we skipped the maple syrup - whipped cream and strawberries would be just right if you have them! Oh, pozole. It's just the thing in the winter - a hot, chile infused, pork filled soup with a multitude of little toppings to dress it up. I love it but hardly ever make it at home because it can be pretty time consuming. I've edited this recipe down so it's easy and has minimal steps. If you've never had it, it is a brothy mexican soup made with chiles, pork and hominy. There are two kinds that I'm aware of - rojo (red) and verde (green). This is the red one. Toppings like any combination of toasted tortillas, cheese, avocado, sliced radishes, shredded cabbage, cilantro leaves, diced white onion and lime wedges should be served with it. A note on ingredients: hominy is a dried corn kernel that has been nixtamalized, meaning it was soaked in an alkali mineral bath that makes it easier to digest. You can find it dried or canned. Canned is much more convenient, just drain, rinse and add it to the soup. Treat the dried stuff as you would dried beans, soak overnight and simmer in a large pot of water for a few hours until softened. They will be puffy and chewy. To make the tortilla crisps in the photo, just heat a soft corn tortilla in a skillet over medium heat until it it crisp, golden and blistered, flip and repeat on the reverse. In a small skillet over medium high heat, toast ancho pepper. It will puff up and become toasty. Be careful not to burn it - it won't taste good. Once toasted, remove and discard stem, seeds and membranes. Break into pieces, cover with 1 cup boiling water. Cover and set aside for 15 minutes. In a medium pot, heat a dash of oil over medium heat. Cook pork, garlic, bay leaf, oregano and cumin until fragrant, about 2 minutes. Add stock and hominy. Bring to a boil, reduce to a simmer. Blend chile with soaking liquid until very smooth. Add to soup. Continue to simmer until hominy is nice and soft, wanting to fall apart, maybe 30 minutes overall, depends on what kind you used, Add more water or stock during cooking if needed. Season with salt, pepper and lime juice. Serve with garnishes on the sides like toasted tortillas, cheese, avocado, sliced radishes, shredded cabbage, cilantro leaves, diced white onion and lime wedges. Happy 2018!! Let's start things off right with these grain free cookies. I've been hiding a bag of chocolate chips on myself for the last month or so until I felt like whipping these up. I have a hiding spot in one of the difficult to reach cupboards that I never go into and that is away from all the other food. I use this to hide things from myself like crackers specifically for a get together, nutella or chocolate chips. I would have eaten these chocolate chips if I had not hidden them, same for said crackers. Maybe not the same for the nutella. Back to the cookies! These are a super yummy chocolate chip cookie made with almond flour and sweetened with maple syrup. I'm really pleased with this recipe: grain free, paleo, dairy free, refined sugar free, easy to make and soft. I like a soft cc cookie, don't you? A note on ingredients: Use almond flour, not almond meal. I use Nutiva coconut and red palm shortening. The coffee grounds should be very fine, like espresso. I had courser drip sized grounds here so I buzzed them in the grinder for a few seconds until they were fine. They can be considered optional but really give these cookies a warm, toasty flavor. I also used an electric hand mixer for all of the mixing, besides folding in the chocolate chips. You can also use a stand mixer with the paddle attachment. In a bowl, whisk flour, baking soda, salt, cinnamon and coffee to evenly combine. Set aside. In a mixing bowl, use a hand mixer to beat shortening and maple syrup together until it no longer looks curdled, about 2 minutes. Add eggs and vanilla, mix 2 minutes more. Mixture will look weird and slightly curdled or separated. This is ok. Add dry ingredients to wet and mix well. Fold in chocolate chips. The batter will seem much different than your usual cookie dough - lighter, wetter and stickier. This is ok.
Chill in refrigerator for 30 minutes. In the meantime, heat oven to 350 degrees and line two cookie sheets with a silicone baking mat or lightly oiled parchment paper. Remove dough from fridge and drop tablespoon sized spoonfuls of dough onto the prepared trays. Give them some room as they will spread when baking. Bake 15 minutes. Remove from oven and let cool a bit on pan before removing. Cookies are best warm out of the oven or stored in the fridge in an airtight container. Christmas is ONE WEEK AWAY! Have you finished your holiday shopping yet? Here's a little last minute gift guide if you need a little inspiration. You'll find something for her, for him and all those people you might have forgot to shop for. 1. Birchbox, $30 for 3 month subscription Your best bet for absolute last minute gifting. Give a 3 month subscription, print out the gift receipt and put it in a card or schedule an email notification to the recipient. Men and womens boxes available. It's s fun gift because everyone like getting things in the mail. 2. HP Sprocket, $129 at best buy - for printing mini photos (that are also stickers!) wirelessly from your phone or tablet. 3. Dakota Backpack, $175 at Dagnedover.com The neoprene material is unexpected and holds its shape. Comes in 5 colors. I love the chunky zippers and interior pocket. 4. Obama: An Intimate Portrait by Pete Souza, $31 on Amazon.com To perk them up with one beautiful iconic Obama photo after the next. 5. Breville Compact Juicer, $99 at Bed Bath and Beyond because everyone wants more kale juice in their life. This one accepts whole fruits and vegetables, has a small foot print for tiny NYC apartment life and is easy to clean. 6. Lekoch flatware, $22.99 on Amazon.com This flatware is so good it drives me CRAZY. It must be the food blogger in me but it's just so damn elegant and modern. 7. Kombucha Home Brewing Kit, $45 on Uncommongoods.com We all want to make more of our own things and fermentation is bubbly, exciting and impressive. 8. The First Mess Cookbook, $22 on Amazon.com Because come January first everyone we know will be gyming, cleansing and eating healthy. Give someone a boost with this cookbook full for incredible plant based recipes. 9. Mast Brothers Chocolate Library, $75 on Mastbrothers.com or a collection of bars from your city's local artisanal chocolate makers. 10. Catchphrase, $11.99 at Target and some batteries too. Probably the best game to play after your family holiday dinner. We got one last year and it's the new family tradition. 11. Slip Silk Pillowcase, $75 at Sephora It's luxurious, defends against wrinkles and helps with frizzy hair. Also, its sooooo soft. 12. Udon Blanket Kit, $125 on weareknitters.com For the crafty knitter in your life who hasn't bought a scarf or hat in the past 5 years because she knits them all herself. This is a big, cozy, soft wool blanket kit complete with giant needles. 13. Sorel 1964 Premium CVS Boots, $140 on sorel.com For keeping those feet warm in the snow and slip free in the slush. 14. Captivator Love Bath, $12 on cap beauty.com soak up the love with this naturally scented bath mix with magnesium, neroli and sandalwood. 15. Glow Watermelon Sleep Mask, $45 on Sephora.com Glowing skin? Check. Watermelon? Check. All the work done while she sleeps? Check. I made a conventional version of this cranberry bundt cake for Thanksgiving and it was so good I knew I wanted to make a healthier, grain free version. This cake is very balanced - a slightly sweet crumb with a bite of fresh cranberry here and there. If this was made in a loaf pan, I'd call it a cranberry bread. This can be glazed or dusted with powdered sugar and served as dessert or slice a piece off and smear it with coconut butter for breakfast. Or snack on it as is. Would doesn't need more snacking cake in their life? (We all do.) Either way, its a great festive, paleo cake to make for the holiday. Heat oven to 350 degrees. Grease a 12 or 14 cup sized bundt pan and set aside. In a large bowl, whisk together almond flour, coconut flour, baking soda, baking powder, and salt. In a medium bowl, whisk agave, oil, applesauce, eggs, set, juice and vanilla until very smooth. This can be done with a mixer or by hand. Pour wet ingredients into dry ingredient and stir until well combined. Make sure the dry ingredients are very well hydrated. Stir in fresh cranberries. Transfer batter to bundt pan - since this is not a very pourable batter I spoon it into the bundt pan and the smooth the surface with a spatula or spoon. Make sure its even so the cake isn't lopsided. Bake until deep golden brown on top and set in center - about 1 hour and 30 minutes. I like to start checking every 15 minutes after the 1 hour mark. Remove from oven and cool in pan. Invert onto plate and serve.